Helen Chen, Rabbit Rescue & Rehab/AC&C volunteer, holding an adoptable rabbit from Animal Care & Control of NYC (AC&C). New York, NY – Wednesday, January 26, 2011 – It's the Year of the Rabbit, so it is a perfect time for families to consider adopting a loving rabbit into their homes. 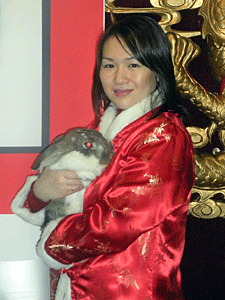 The Mayor's Alliance for NYC's Animals, Rabbit Rescue & Rehab, and Animal Care & Control of NYC (AC&C) will participate in the 12th Annual Lunar New Year Parade & Festival on Sunday, February 6, organized by the Better Chinatown Society, with over a dozen adoptable rabbits in a special van with windowed sides so that everyone can see these adorable pets. The van will be provided by North Shore Animal League America. Helen Chen and Cindy Stutts of Rabbit Rescue & Rehab are attending the press conference with two adorable rabbits for photographs and to answer your questions. The Rabbit Adoption Van in the Chinese Lunar New Year Parade, kicks off the Mayor's Alliance for NYC's Animals' Fifth Annual I Love NYC Pets Month, which features adoption events, spay/neuter, vaccination, and microchipping clinics, training seminars, and more throughout New York City. Rabbits are wonderful house pets. Rabbits can be wonderful additions to a family, and these gentle pets tend to live at least 10 years. Rabbits can be adopted at Animal Care & Control of NYC at 326 East 110th Street (between 1st and 2nd Avenues), where rabbits experts are on hand to provide information on caring for pet rabbits. Learn more about rabbits at www.rabbitcare.org. Focus of this year's event: Pets are Family Too!